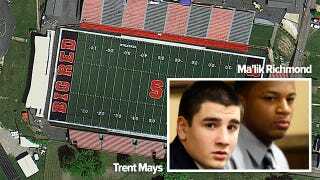 One year ago, Trent Mays and Ma'lik Richmond raped a 16-year-old girl in Steubenville, Ohio. A horrified America watched as mass media echoed internet vigilantes' evidence of a town-wide conspiracy to cover the case. The evidence was false, but the city is still suffering the terrible consequences of those accusations.